"As a director, [Smith] speaks to the issues that interest me in a way that interests me." In 1997, Chasing Amy, the third film from writer-director Kevin Smith hit theaters. I had seen his first film Clerks and liked it, but Chasing Amy was different. It was a film that addressed how it felt to be a Gen X-er in the dating world. It showed us that the rules in dating were not so cut and dry anymore. Chasing Amy was a film that felt both very personal and very universal at the same time. It got me even more excited about film and made me a life-long fan of Kevin Smith. Across the country on the East Coast, author John Kenneth Muir had a similar experience with Chasing Amy. The film planted the seed for the idea to write a book about Kevin Smith. In 2002, that book would finally come to fruition as, An Askew View: The Films of Kevin Smith. The year 2012 has seen Muir update and revise his book to include Smith’s films up to now. 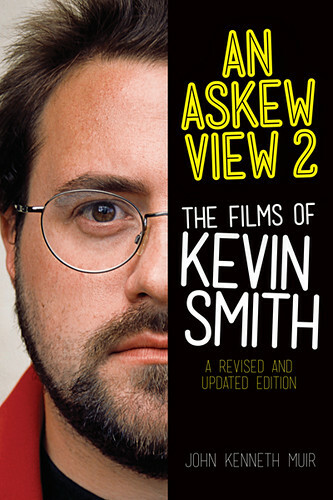 The result is An Askew View 2: The Films of Kevin Smith, A Revised And Updated Edition. John Kenneth Muir is a joy to speak with and to interview. On top of that, he is a hell of a good writer about film and television. With over 18 published titles, Muir knows how to write about the films and television shows that have captured the imaginations of generations. He called me from his home in North Carolina to to talk geek not so long ago. We talked about his beginnings, his writing, and the geeky things we love. It was a long conversation that I wish I could transcribe verbatim for you, but I have pulled some keys elements to share. As a kid, when did you first get into movies? I’m such a movie geek. I probably got into movies and television probably around, I’d say the year was 1975. That was the year I was five going on six. Somewhere around that age. I was into Star Trek on TV, but that was the year Space 1999, this great British sci-fi show came on. It was very cinematic. There were strikes and difficulties in England at the time it was made and a lot of the best technicians worked on Jerry Anderson shows like Space 1999. It was like a movie every week, even though it was an hour long. It had horror and science fiction elements to it. I think that’s the first thing that really got me hooked. And then of course being a child in the '70s, it’s like a big snowball rolling down the hill with Logan’s Run in ‘76, Star Wars in ‘77 and Alien in ‘79. So I’ve just always loved the genres of science fiction and horror. John goes on to tell me about how his “baptism of fire” into the horror genre was Fun House when he was about six years old. And even though it really scared him, he was in love with the horror genre from there. We then spent a lot of time in the interview just talking. John and I talk Space 1999 and his love for the show. We talk about the change in effects from the campy sci-fi shows of the '60s and '70s to the astounding effects of Star Wars and Alien for their time. We also talked about Alien as a horror film and how frightening the idea that we, as humans, are just a place to gestate alien babies. You said you fell in love with movies and television at five or six years old. When did you decide you wanted to start writing about them? My first book was about that show Space 1999, and Space 1999 doesn’t really have a positive reputation among science-fiction fans. Star Trek fans really hated it because at the time Space 1999 came out, Star Trek was trying very hard to get a revival. And suddenly here comes this other show with better special effects. [The Star Trek fans] were like, “We can’t let this succeed because we can’t lose faith in Star Trek and switch over to Space 1999.” It’s always been controverisal. But what I wanted to write in my book was a way to appreciate Space 1999 was to look at all the cinematic techniques in terms of lighting and camera work. You can appreciate it purely on the visual forethinking. I started writing my book because I wanted to read a book about Space 1999 and no one had written it...I wanted to write a companion for Space 1999 and from there it kept going. You write the book you want to read. I always try to have a passion for what I am writing about. John and I talk for a while about how horrible it would be to have to write about things you hate and how writing a review for a bad film is hard enough. He discusses the fact that even in a negative review for a film, he will always point out the things he appreciated rather than damn the whole thing. We talk about how the publicity build up for a book or a film often lets us down. You mentioned that you write about the things you love. Were you a Kevin Smith fan from the start? Did you see Clerks and fall in love or did you catch up later? It’s funny, the exact order isn’t clear to me. I knew when I wanted to write the book, it was after Chasing Amy. I thought it was one of the greatest films of the '90s and seemed very true and hysterically funny. Now I can’t remember if I saw Clerks before that or if I saw Clerks after that and thought, “Oh this guy is great.” I don’t remember for sure. I know the moment that galvanized it for me was Chasing Amy. I know I didn’t see Mall Rats until after that. You mentioned that you wanted to start writing the book after Chasing Amy and that film came out in 1997. Did you start the book then or was it a while after that? Well what happened as I recall is that Chasing Amy was sort of the dam breaking. I was like, “Oh my god, I’ve got to see everythig this guy does.” And I am sure I saw Clerks and I loved Clerks because I absolutely do think that’s a great film. I’m sure I saw Mall Rats at that point. Then Dogma came out in 1999. The way my career worked is that I started looking for an agent in the early 2000s, 2001, 2002. I got an agent and we talked about what books I wanted to pitch. I said I’d like to do a Kevin Smith book or a Brian De Palma book; those are two of my favorite directors. And I have a really great agent agent and she said, “Kevin Smith is a really interesting guy and my son loves him and all his friends love him. I made up proposals for both and let’s see which one floats.” And almost immediately the Kevin Smith one got picked up by Applause Theatre and Cinema Books, the publisher for An Askew View. That happened very shortly after or when they were finishing up Jay and Silent Bob Strike Back. I was able to talk to people about that movie. It must have been after because there were talks of Jersey Girl being the next project. We definately covered the Clerks TV show which was 2000. So that must have been how it was. There was a very short window for that book. I think the contract didn’t get approved until 2002 and the book had to be done a couple of months later. But it went very well and it came together quickly. I knew what I wanted to say and we had a lot of help from the people involved in the films. At that point, Jersey Girl was on the horizon, so I didn’t start right after I saw Chasing Amy, but it was in my mind. I thought this guy is great and I want him to make a couple more films. That’s what my introduction in the first edition is about. My friend and I have this joke that you can’t write about a director until he’s made five films. It’s the Planet of The Apes principle. There have been five Planet of The Apes films and you couldn’t write about Planet of The Apes until there were five films. You can’t just write about a director whose done three films. It seems like as soon as Kevin Smith crossed that threshold, we got the book sold. But for me, three was the magic number for him. Chasing Amy is still my favorite Kevin Smith movie. It really dealt with dating and sexuality in a way that had not been portrayed on film before. You write with great affection for the film in An Askew View 2. Is it your favorite Kevin Smith film? For me, I have a battle between my light Kevin Smith, meaning go towards the light, and the dark Kevin Smith. To me, my two favorite movies are Chasing Amy and Red State. Chasing Amy is such a full human story. It touches your emotions, but at the end you feel like it’s gonna be okay. Red State is this ultra-violent dark film that speaks to our time too. That to me is the perfect Yin and Yang of Kevin Smith right there. John also mentions he likes all of Smith’s films, even the ones that could have been better. He cites Jersey Girl specifically. We spend some time talking about Smith and his directing style. John and I both have a fondness for it and agree he shouldn’t try and be anyone but Kevin Smith. De Palma, Spielberg, and Woody Allen all come up for their merits and achievements. John and I also talk about people being famous for the sake of being famous. We both agree if you want to make it in the art world, you actually have to contribute something. Both of us are tired of frustrated artists and writers tearing down others in place of offering up something themsleves. John and I talk more about Chasing Amy and how Kevin Smith makes films of several genres. That fact alone, is what makes him appealing as a filmmaker. He knows that his audience doesn’t just like silly films, but heartfelt ones, and deep ones and violent ones. With the first edition of the book, An Askew View, how much help did you have from the Askew View camp? Did you have access to Kevin Smith? You have a lot of quotes from people like Brian O’Halloran and Walt Flanagan. How much access did you have to them in the second book? In an An Askew View 2, the format changes a bit in the second half. You’re absolutely right [about the format change]. When I wrote the book originally, I worked very closely with the camp. I don’t want to give you the impression that I was talking with Kevin Smith, because I wasn’t. I was talking to his assistant and she would give me the phone numbers of the people to interview. I’d set up interviews and often do two-hour interviews wth them and it was a whole circle of people. I talked with those people you mentioned and Jason Mewes, Scott Moiser, those folks. And they were wonderful, they’re just some of the most wonderful, kind and hysterically funny people you’re ever gonna meet. Doing those interviews was a pure joy and a highlight of my career. We tried to get an interview with Kevin Smith, but again the timing was so tight. We scheduled it two times and then something came up and we weren’t able to do it. I did get a very nice email from Mr. Smith after the book came out saying that he enjoyed it very much and asking how it was doing. Now when it came around to do this update for the second volume, I wasn’t able to get the help from the people. I don’t know why, so I wouldn’t speculate. That dictated why the format changed a little bit...I’m very, very grateful for the help they gave the book 10 years ago. That made a great book. Very happy with the second edition as well. As an author, I get to take the reigns a little bit more and I’m more confident talking about the films. I feel like the balance is good between the two parts.That’s why I separated it the way I did. John spends some time talking about how Smith went from being a critical darling to getting caustic reviews from critics. He understands why Smith would want to retire, but again hopes he doesn’t. What do you not like about what is going on with film criticism in this day and age? To talk about the status of film criticism today, some people cannot thread that needle so they make it personal. They decide they don’t like Ben Affleck because he dated Jennifer Lopez and they review his movie based on the fact that they don’t like him rather than what the quality of the movie was. It’s a lot of personal grudge criticism that I don’t like. I really like that you brought that up in An Askew View 2. You talked about the personal issues that Kevin Smith had been going through and reviewers glomming on to those issues instead of really reviewing his films. It seems like we are in a time where many journalists don’t know where the line is between gossip and real facts. I agree with you. There are two points in Kevin Smith’s career where that happened. It happened with Jersey Girl and the Bennifer thing. Then it happened with Cop Out with the Southwest thing. Any critic can respond to either of those films positively or negatively. But whether Kevin Smith was booted off a plane for his weight doesn’t play into the quality of Cop Out. If you don’t like buddy-cop movies, say you don’t like buddy-cop movies and this doesn’t work for A,B, and C. But you don’t go after a guy for his weight and make that the headline...focus on the work. I think the fact that we pass judgement on actors or directors based on the flow of information through gossip sites and gossip tv shows is very problematic. Do you feel a connection to Kevin Smith since you are both from New Jersey? The thing that appeals to me about Kevin Smith is, yes I’m from New Jersey, but beyond that the generational thing is important to me. As a director, he speaks to the issues that interest me in a way that interests me. Like wow, he’s talking about these things as I’m going through them. As he’s faling in love and getting married, I’m falling in love and getting married. As he is contemplating his religion and faith, that’s what I’m doing. As he has a child, now I have a child. It’s like wow he’s going through it right there with me. That’s why I don’t want him to quit. Because when he’s going into the nursing home and I’m going into the nursing home, I want that movie. There is a kinship I feel with Kevin Smith. The examples he uses in his films, the films he alludes to, just his whole manner of being. The way the men and women in his films talk is the way that me and my buddies and my wife talk. Hopefully not as foulmouthed, but that’s what makes it funny. This is a guy from my generation who made it and who is making the movies about us and our lives and what we are going through. That is the thing about Kevin Smith for me. He creates these universal stories but gives them touchstones that we can recognize being from that generation. Talking with John Kenneth Muir was a breath of fresh air. He definitely writes about film and television with a critical eye. But that eye looks through the lens of love and passion for the things he writes about. Many critics today should take a page from any of his books and learn from them. He is not only a good writer, but an informed one. An Askew View 2 is a great book for new and old Kevin Smith fans. I also recommend checking out any of Muir’s other books. You can find them on his website and follow him on Twitter at @JKMuir.